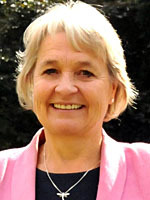 Amanda Jupp worked for 20 years for a National Charity which advises and supports older people. She has been involved in the local community for over 40 years. Amanda is married with three adult children. She fundraises for local charities and organisations. In her childhood she lived abroad, she speaks French and enjoys sport, singing, theatre, music and travelling. Amanda is the Cabinet Member for Adults and Health.